So, Radiant One … how to make love-based decisions in business. That is what this episode is going to be all about. First of all, I want to start by saying that you being here, chances are that you are a soul-driven, heart-based spiritual entrepreneur, someone who’s made the journey from their minds into their hearts in probably your life in general. However, that may not yet have been translated into business. So what I want to do with this episode is I want to inspire you to make or take the same kind of love-based decisions that you make for yourself and for your family and your life, I want for you to transfer that into your business because when you do that, miracles occur. There is a lot of satisfaction and content that happens and truth be told the world needs that. I don’t think that any of us who are within the industry of serving, of being part of people’s awakening, healing, and transformation and wanting to be of service – I don’t think that any of us don’t know that that’s what – that’s the way. But we’ve been conditioned by a patriarchal, archaic, shadow-based, fear-based society and mindset into believing that the way of doing business has to be done in a certain way. So all of those clearings that you’ve made, all of the shifts that you’ve held space for, the transformations, the clearing of trauma and all that you’ve done for yourself personally – well, I see that as part of your journey and also part of having a soul-driven, heart-based business because when we do that, when I do that and when you do that, we hold space for those that come after. So that’s what this episode is going to be all about. I want to say that to me making love-based decisions in my business is a way of life now. It wasn’t at all in the beginning. So it wasn’t until recently when I had some beautiful radiant souls going through one of my programs called “Mastery Through Love” and I knew and understood the effect that making love-based decisions in my business have for me personally, both in my business and for those that I hold space for. But having it reflected back to me just how powerful that is for others as well was a real eye-opener and a revelation and maybe I “should have known” this but there was a part of me that just didn’t and also probably because like I said it’s something that I work with for a very long time now, almost a decade. So those decisions are second nature to me. I don’t really – I want to say that there are times when I do think about when the word comes up in my mind or the question does come up, “Is this love-based or not?”. But most of the times, it’s now become an automatic reflection. I’m going to, in the show notes, be sharing some episodes about how you can make the transformation and what happens in terms of when we implement and create new ways of being and new ways of doing. So that’s out of the way. So what is a love-based decision when it comes to business? I think that’s where I want to start. First of all, it’s something that is aligned with your core and your truth and only you can know what your core and your truth is all about. But there are some typical themes that I see with those that I work with. Perhaps making a love-based decision for you means that you – maybe it’s time for you to raise your prices? Maybe you’ve been working for a very long time. You’ve been putting your services and your products into the world and you pouring that in, maybe it’s time. If you haven’t, maybe it’s time to raise your prices. I don’t know but that’s one of the things that I see. Another thing is maybe it’s time to say “goodbye” or “no” to certain clients. If there is a specific client where you can see that the energy is off and it doesn’t serve you nor them and especially not you, then it’s okay to say no. It’s also okay to let them go and say goodbye. That can be done from a space of love and from a space of heart and maybe that’s time. Sharing your products and services? Maybe it’s about sharing your services and your products with the world? Maybe you’ve been hiding and you’ve been holding back and you haven’t really shared what’s on your heart and your soul’s divine purpose. So maybe that’s the love-based decision is to take that step out and begin to share yourself with the world in whatever form that may look like. Maybe it’s working with someone like me, whether it be in one-on-one or mastermind or my programs or maybe it’s simply committing to a practice of discernment, of knowing when you’re in “love” or out of love and then align your decisions – and I mean every decision you make in your business – with love. 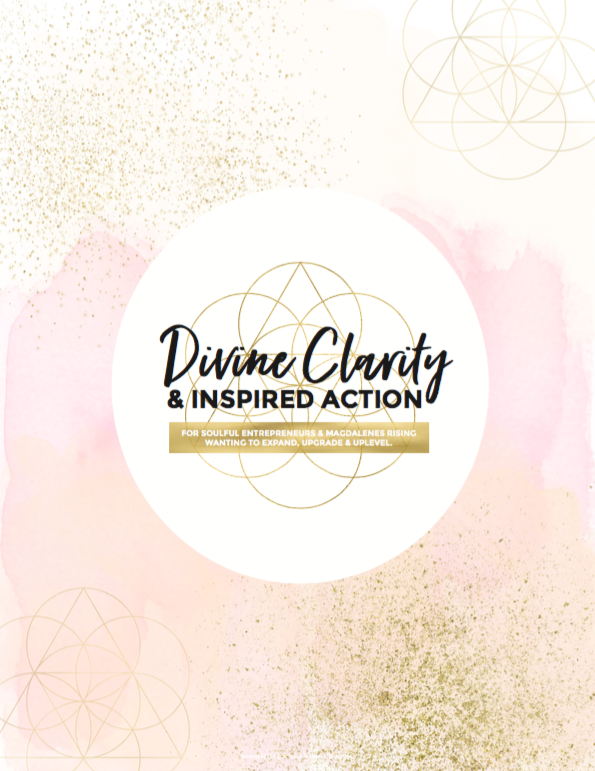 Know that when you do that – so you may be completely in sync and aligned with this in other areas of your life but when it comes to your business, that may not be the case. So know that when you start this process, you can experience anxiety. You can experience fear and so forth. So it does require some courage for you to step out of where you’ve previously been at and into that new paradigm as I call it. It’s a new paradigm of love, of love-based. I want to make it clear that when I say love-based decisions, I’m not talking about not charging the right prices for your services. I’m not talking about not setting boundaries and letting yourself be walked all over. I’m actually talking about just the opposite because to me, having a love-based business and making love-based decisions in your business means that you honor yourself. It means that you value yourself. It means that you love yourself and it means that you do set boundaries. It means that you do charge the right prices for your services and your products and it does mean that you say no to clients and things and products and services and opportunities that will not serve you and what you’re here to do. Again, the word success to me is loaded because it does have a ring to it of something outside of yourself and I don’t see it as that. So it’s about how do you – but there are tools you can use to set yourself up for “success” in terms of making love-based decisions in your business. I want to go through some of them. So the first one is you can, for example, you can have a Post-it note. Write a Post-it note – just write “love” on it or whatever you need to have to remind yourself of it. Before you jump into the, “Oh, well, if I’m making love-based decisions, it should just come automatically,” know that I agree with you. But it’s just not the way because we have free will. Free will means that love is a choice for you and something you have to actively implement and call into your life and allow to be the driver of your life. Fear is what will come flying at your face when you least expect it, don’t want it, and it will trap you and block you and hinder you and so forth without your permission. Love won’t force itself upon you without your permission. That’s simply against the whole nature of love. So Post It notes on your bathroom mirror. So that’s another opportunity and one thing that I love because most of us always carry our phones with us is I love setting alarms on your phone. So having an alarm go off every hour, 5 times a day, 3 times a day, whatever, morning, noon, and night. Have it be a mantra, like “I choose love” or just have “love,” “making love-based decisions,” so that you’re reminded of it. Because it’s basically a training. I consider this to be a strengthening of that muscle, of creating love-based decisions. So those were three things that you can do in order to make and take love-based decisions in your business. Of course, there’s also if you want to have support and if you want to have commitment and accountability as you do this, The Magdalene Rising Mastermind is open for enrollment. These are going to be 10 months of us being together where love-based decisions is the core of everything. Because it’s the core of everything that I am and everything that I do. Throughout our almost 10 months together, you’re going to consistently be asked to return to what is the most loving, kind, caring, compassionate thing for you in your business. That is basically what you’re going to be hearing me say over and over and over again. That is meant to serve you. It’s meant to strengthen you. If that’s something that you would like to have support in implementing that mindset, check out the mastermind that I’m running. It’s open for enrollment and early bird ends on December 21st. Know that only you can know what a love-based decision is for you and know that a love-based decision is not something – that it’s not rushed. It is not filled with – it may be filled with excitement and excitement may appear in the sense of slight fear. But there’s really no difference so know that you can only know but know that a love-based decision is not something that necessarily needs to be rushed because within the realm of love, there is only divine timing. There is always enough time so you don’t have to rush to make a decision. But again only you can know what that decision and what that loving thing is for you. In the Comments, I would love to hear from you. What is one tool or measure that you will implement and take so that you ensure that you’re moving forward and committing to doing or taking love-based decisions in your business? So that’s what I have for you – how to make love-based decisions in business. I hope that it serves you. The Evolution of Trust into Knowing – Episode on The Magdalene Voices.